Road trips away from town to go camping is a great way to spend time with friends and family. Bringing a camper along affords you some of the comforts of home while experiencing the serenity of nature. 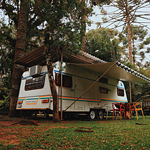 At Lithia Nissan of Medford, we want you to be aware of some tips to keep in mind to prepare your vehicle to tow the camper. The most important thing to consider is the tow capacity of your current vehicle. This must be determined before you shop for a trailer so that you don't choose one that your vehicle can't tow. You will also want to be aware of how your vehicle tows campers. SUV use conventional towing while pickups may also include 5th wheel and Gooseneck towing. The latter two allow for larger trailers. Another factor to consider is how to reduce sway while out on the road towing your camper. As the size of a trailer increases, the more that it is affected by the wind. Sway bars help with this. They attach to the frame of the trailer and also to your vehicles tow hitch.